My conscience commissions me/to take pen and paper/and give meaning to the meaningless word./Your silence castrates me./Day dawns but I am weary/the pages empty, the hours wasted./What is your glory or right?/I would know you/if Knowledge was Freedom./Yet, I am aware of its lie/for knowledge promises prison./I would love you/if Love was Justice./But, law shattered this myth/in the broken faces of his children./I would die for you/if Death was Victory./No, death is defeat/when the hour is not in hand./All this you know and the/unspoken I know not./For after your words/I am ignorant./In the teeth of powers against you/I am weak./And in your woman’s loneliness/I am numb. “Free Angela Davis & All Political Prisoners,” a documentary film by a Shola Lynch was featured at the Toronto International Film Festival last September. From the clip below it looks like it does a very good job of documenting Davis’s life and the events surrounding her imprisonment and trial from 1970 – 1972. She was arrested after my freshman year at Stephens College, an all girls school in Columbia, Missouri. Mere months before Angela Davis was put on the FBI’s most wanted list, I visited Fred Hampton, leader of the Black Panther Party in Chicago, Illinois. I interviewed him for research on a paper I was writing, for a class, about revolution. He was a soft spoken, young black man committed to improving the lives of black people. In less than two weeks of my return to college, police murdered Hampton while he was sleeping. That event, coupled with the earlier police brutality I had seen inflicted on peaceful protesters during the Democratic Presidential Convention, and then the arrest of Angela, led me to take a position of opposition and distrust of the American government and “system” for my young adult years. Angela Davis was hired to teach Marxism at UCLA and later fired because she was a member of the Communist Party. Then her affiliation with the Black Panther party and her association with imprisoned members, led to the trumped up charges that placed her in jail and on trial. While she was in prison I wrote her a note, just saying I knew she was innocent and supported her cause. I was very surprised when I received a hand written note from her from jail. That she would take the time to write a total stranger, in her situation, greatly impressed me, and confirmed my feeling that she was not a criminal. I wrote the above poem some time after receiving her letter. Yes, she was found innocent of the charges against her, became a professor at the University of California in Santa Cruz, and continues to work for social justice. When I was living in Washington, DC, a few years later, I met Angela Davis in person. She and I both appeared in a program against South African Apartheid. I danced, she spoke. She appeared shy and nervous, was chain smoking, and still wore her large Afro. In the late eighties, once again, I was graced to be in the company of Angela Davis. This time we met at a woman’s conference in a former convent in Pennsylvania. I represented the Austin, Texas Women’s Peace House. This Angela Davis was the one wearing long locks, no longer smoking cigarettes, her skin vibrant and glowing, her smile warm and welcoming. She was approachable and we engaged in a friendly conversation. Now Angela’s smile is wisely warm as we can see from the photo of her appearance in Toronto last year. This movie trailer gives a good preview of the quality of the documentary. 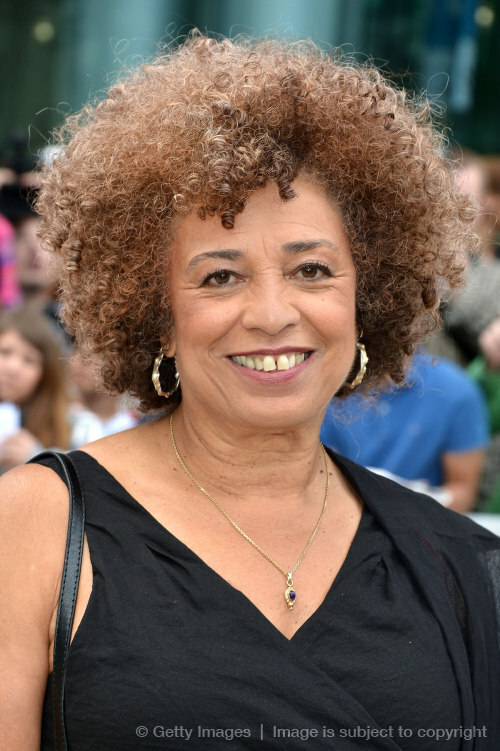 The press conference provides insight into Angela Davis and the purpose of the film. Thanks so much for reading and your comments. You will find the press conference equally informative and inspiring, it’s so interesting the 40 minutes passes quickly. I still have a “Free Angela” button tucked away somewhere. My sister, 8 years younger than myself, was still a child way back then & thought that Ms Davis’ name was Free Angela. You’re fortunate to have met her personally. I’m envious. Thanks for sharing your story. Yes, I was fortunate, she is an inspiring woman. How inspiring is it when a so-called “ordinary” person (that is, not a movie star or wealthy politician) takes a stand and is willing to sacrifice so much for what she believes in? Those are the truly extraordinary people, and it’s great that you got to meet her and exchange correspondence. The poem is incredible. The story is fascinating. 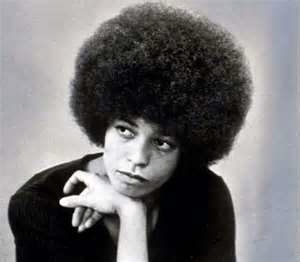 Thanks for the introduction to Angela Davis. And I’m glad to hear she kicked the habit–it is one of the hardest habits to kick. Thanks for reading. I’m so glad that I’ve been able to introduce this brave woman to people who didn’t know about her. Thanks for the insight with story and verse, I was reading about Angela about 8 months ago, along with stories about a few other people from around the globe.. Thank you, thank you, thank you, for introducing me to such an inspiring person like Angela. She’s what I call a heroine in the face of a painful struggle for what is fair and right.